I’d like to announce the release of a new Haskell library named credentials, which allows you to securely share encrypted credentials (secrets) from within your Haskell applications. An administration CLI has also been released which allows you to manage the credentials or access them from non-Haskell applications. If you just want to know how to use the library or CLI, skip ahead to the Usage section. This work is based on credstash and was motivated by work with my previous colleagues at Fugue, as well as a desire for similar functionally directly embeddable as a library in Haskell. When deploying modern applications either on-premise or within a cloud environment such as AWS, you typically need access to a multitude of secrets such as database credentials, API keys for external third parties, or credentials for inter-service communication with our micro-service overlords. it needs to be stored as securely as the data it protects. The credentials library and the related credentials-cli are a simple and secure solution to this problem, designed to rely on a minimal number of external dependencies that are as close to operations-free as possible. It uses Amazon’s Key Management Service (KMS) for master key management, performs all encryption locally, and then stores encryption parameters and metadata in DynamoDB to facilitate sharing and administration. Secure localised encryption and decryption of plaintext. Means for verifying data integrity. Management of credentials, such as creation, deletion, querying, and revocation. Granular access control of all facets of the system. What follows is a slightly whirlwind tour of the use of KMS, DynamoDB, and the actual encryption routines. Encryption and decryption of credentials use a master encryption key, which usually creates the additional problem of how to securely store and manage said key. When the key used to encrypt any number of credentials becomes compromised, all credentials themselves are also compromised. Secure administration and usage of the master keys is a difficult problem typically requiring a solution such as dedicated Hardware Security Modules (HSMs) to support features like revocation, renewal, and replacement. KMS provides a programmatic API resembling a remote HSM. It offers a number of useful features such as centralised key management, secure storage, key renewal and revocation, as well as auditing via CloudTrail. This means the master key we’ll use is stored in secure HSM-backed storage and never leaves the KMS service. You generate a master key via the API or developer console. This key, once generated is never accessible, and the address is only used as a parameter to additional API calls via an Amazon Resource Name (ARN) or alias you assign when creating the key. You send data to encrypt/decrypt to the API and say encrypt/decrypt this blob with the specified master key, and the resulting ciphertext or plaintext is returned. This has two drawbacks. Firstly, your data is transmitted unencrypted to Amazon. Secondly, each API operation has a 4KB limit for the blob (plaintext or ciphertext) you transmit. 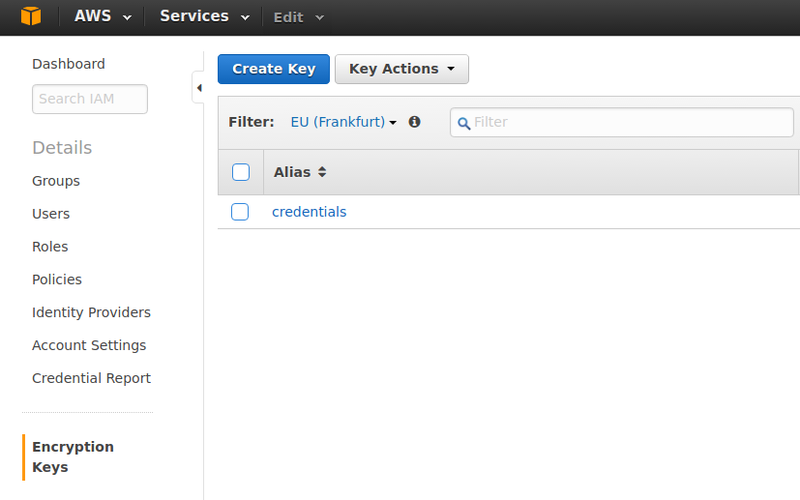 Create a fresh data key using the GenerateDataKey API operation. Use the data key to encrypt your data locally. Use KMS to encrypt the data key with the specified master key. This is called key wrapping, and the encrypted data is now called a “wrapped key”. Store the encrypted data and the wrapped key. Note: this is not “encraption” (the practice of storing a key next to the data that it protects), because without access to the master key that wraps the data key, the data key is useless. It is an opaque blob. Retrieve the encrypted data and the wrapped key. Use KMS to decrypt the wrapped key, to obtain the data key. Use the data key to decrypt the encrypted data. Hence the terminology “master key” when referring to the keys provided by KMS. These keys are not infact used for encryption of your actual data, but instead a single master key can be used to protect many data keys, which in turn are used to encrypt your actual data. Once credentials have been encrypted, the ciphertext and related encryption parameters need to be stored in a centralised location to allow sharing, and preferrably in storage that is operations-free. Since one Amazon service is already in use (KMS), we’ll use DynamoDB although there is nothing preventing the use of other storage backends such as S3, Postgres, or Redis outside of request latency, ciphertext size, etc. To store the encrypted credentials, we’ll support only insertion of a new version of the contents for the given credential name. This allows use-cases such as rolling out a new service while an existing version of the service is still using a similarly older version of the same credential. This dicates the schema for our DynamoDB table since we’ll need to query via the credential name, and possibility it’s version. Perform a strongly consistent read to obtain the latest version for name. Generate a unique revision based on the current timestamp and desired version. Attempt to insert with a conditional check that will only allow the insert to succeed if the result would be the desired version exists with the exact revision we just generated. Additionally since the internal representation of version is convenient as an integer (for sorting, incrementing), if we support version deletion this sequence will be non-monotonic if the latest is deleted, and will contain gaps if historical versions are deleted. To hide this from the end user we’ll instead return an opaque revision which can be used along with the name as part of an efficient secondary index query. Granular access control of this scheme can be controlled via standard Amazon Identity and Access Management (IAM) features. Restriction of KMS master keys, such as production vs development. Restriction of different DynamoDB credential tables, such as production vs development, or individual credential names, via DynamoDB conditions. Grant DynamoDB CreateTable and DeleteTable only to administrators. Grant KMS GenerateDataKey and DynamoDB PutItem to power users. Grant only KMS Decrypt and DynamoDB Query to read only users. IAM offers alot of granularity and power at the expense of being confusing for the uninitiated. A couple of canned IAM policies are provided in the README to help you get started. A single master key in KMS costs $1 USD per month. The DynamoDB table throughput is configured to use 1 provisioned read and 1 provisioned write, so if you are using less than the free tier limit of 25 reads and 25 writes per second, only the KMS charges will apply. If you are likely to utilise much more than 25 reads/writes per second, you can estimate your monthly charges by using the AWS pricing calculator. TL;DR, $1 USD per month for the predicted usecase. -- the ciphertext and plaintext variants of the key. -- HMAC SHA256 of the encrypted ciphertext. -- because no data key is ever reused. -- and are made available to the decryption routine. return ( ciphertextKey -- The encrypted data key from generateDataKey. , ciphertext    -- The resulting encrypted ciphertext. , digest        -- A digest used to check ciphertext integrity. The use of a null initialisation vector (IV), because of key uniqueness. An AES256 block cipher running in CTR mode. Generating an HMAC digest of the encrypted ciphertext (Encrypt-then-MAC). -- We call KMS to decrypt the wrapped key. -- Again split the plaintext key into it's sub-parts. -- comparing a new HMAC SHA256 digest. -- Perform decryption of the ciphertext. You will need your AWS credentials available in either the standard ~/.aws/credentials file, or AWS_ACCESS_KEY_ID and AWS_SECRET_ACCESS_KEY environment variables if running on a local development machine. If you’re running on an EC2 instance, the IAM role credentials will be retrieved from the instance metadata automatically. If you are likely to be using only one master key initially, it’s recommended to create a new key with the alias credentials, as that is what the CLI and library parameters default to. Installation of the CLI can be achieved by either cabal install credentials-cli or stack install credentials-cli. This will install an executable named credentials to either cabal or stacks preferred location. Setting up dynamo:///credentials in eu-central-1. $ credentials insert --name foo --secret "A magical secret." Additional means of formatting the output and logging suitable for use in shell scripts is available, see the --help text for more information. Once the KMS master key and DynamoDB table (via credentials setup) exist, you can use the credentials library by adding it to the build-depends section of your project’s cabal file. The AWS credentials used for authentication and authorisation are discovered by the underlying amazonka library. The following example retrieves a database connection string containing a sensitive password, when a webserver starts. It’s worth pointing out the setup all pertains to the underlying amazonka library, since all of the credentials operations run in a MonadAWS context. -- which will print AWS debug information and errors to stdout. -- performing sequence credentials operation(s). -- For 'select', the plaintext and corresponding revision is returned. -- revision results in the latest revision of the credential. -- We can now connect to the database using our sensitive connection URI. Hopefully this illustrates the simple, transparent nature of retrieving encrypted credentials. Please see the README or documentation for more information. Leases and temporary credentials as well as access expiry. Different storage backends, such as S3 for large file storage. An audit trail for individual credential modification. You can read the CHANGELOG for the 1.4.0 release which introduces these libraries here. As a continuation of my master plan to erode legitimate reasons for management rejection of languages like Haskell (due to say, library availability), I’m pleased to announce the initial release of gogol - a Haskell suite of libraries for interacting with the publicly available Google Service APIs. These libraries are generated from the Google Discovery Service and provided interface is stylistically similar to the amazonka libraries, with separate libraries per API endpoint, the ability to construct a request from the minimum required fields using a smart constructor, and a very lens oriented interface. Due to the namespacing of the Google API and how products are aligned in the documentation, library names are somewhat non-intuitive. For example: The androidpublisher API endpoint is branded as the Google Play Developer API, with the corresponding Haskell library being named gogol-android-publisher. This scheme follows the official client(s), and hopefully the inline Haddock links and description provided are sufficient to determine which libraries match with what product. The Google category on Hackage. The source repository on GitHub. Please keep in mind it’s still a work in progress and I’ll be working over the coming weeks to iron out some of the rougher edges, as well as adding more examples and documentation. You can read the CHANGELOG for the 1.3.3 release which introduces these libraries here.